Also known as enamel hypoplasia, white spots on the teeth are enough to cause embarrassment for many - often resulting in low confidence in their smile. White spots are often detected on your front teeth. They appear on the front teeth as a milky white discoloration and can be smooth or rough in texture. Sometimes these spots can have a yellow or brown appearance as well. Excessive amounts of fluoride intake while teeth are developing also known as "mild fluorosis"
Sometimes, there is no direct cause that can be pinpointed. 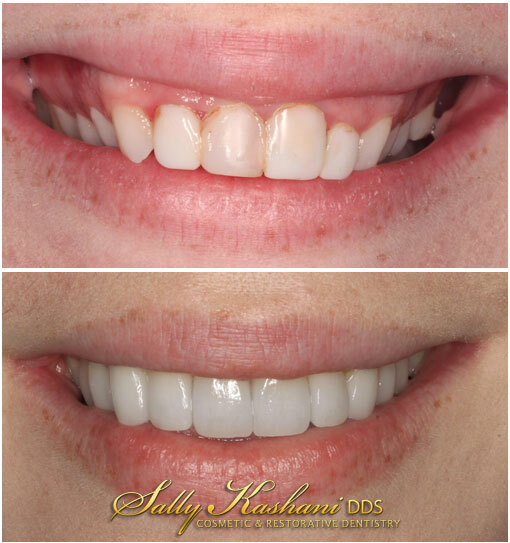 In any case, white spots can effectively be treated and removed by Dr. Sally Kashani at her Hollywood dental practice. It's important to note that white spots can be either inactive or active. Inactive white spots are harmless and are merely just an aesthetic issue, whereas active white spots are highly prone to decay, encouraging you to seek treatment before more serious issues arise. Active white and yellow spots are usually soft and can be flaky and scrubbed away revealing soft dental enamel. These can easily be removed and filled in with dental composites or bondings. How Does Dr. Sally Treat White Spots? MI Paste and MI Paste Plus – a topical tooth cream that helps smooth out white spots and strengthens enamel in order to prevent decay. Great for inactive and mildly active white spots. It re-calcifies teeth and can blend in white spots. It works best when worn with a bleaching tray overnight. An initial process is done in the office to have the MI paste sink deeper into the tooth pores. This is a non invasive process that requires patience and compliance at home but is well worth it! Cosmetic dentistry procedures such as a small bondings can be done to cover up larger spots. Why Wait? Fix Your White & Yellow Spots TODAY! A free consultation with Dr. Sally will help determine the best option for you. Dr. Sally must first determine whether or not you white spots are active or not before recommending the best treatment. You can easily schedule a consultation today by calling our office at (818) 508–7272.